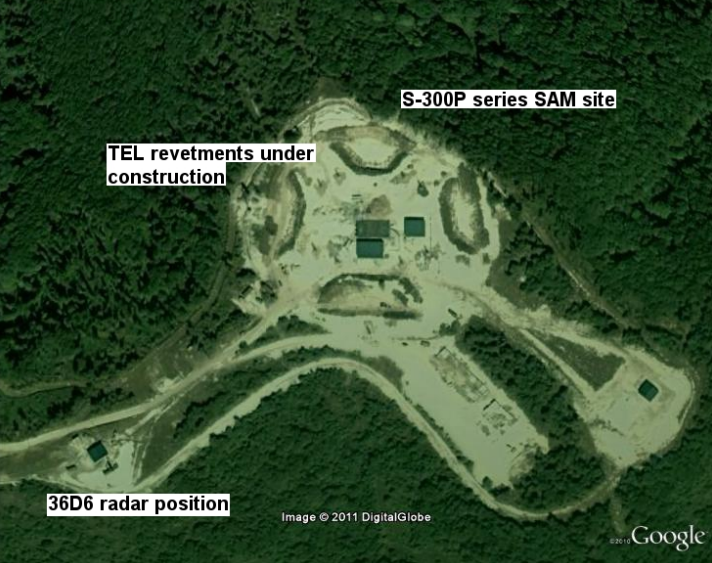 Satellite photos of air defense systems in Nagorno Karabakh. This well organised overlapping [air defense] system will deny Armenia any chance of sorties within Azerbaijan’s territory along the Nagorno Karabagh border. Its air force will cover the gaps for the protection for the rest of the nation if Armenia takes desperate measures to inflict extra losses. For the time being Armenia’s limited air arm provides no real threat for any strikes within Azeri territory, the only threat being the R-17 [Scud missiles]. Baku’s main concern is Armenia’s R-17 (SCUD) [short-range ballistic missile] inventory. The major powers all have interest in this oil rich area and currently American interests have helped develop part of Azerbaijan’s navy with radars, military supervision and many joint military exercises. Armenia’s limited number of ballistic missiles will only strike Azerbaijan with psychological damage as the accuracy (CEP) will be a limiting factor and cannot guarantee the total destruction of the oil fields. A barrage of semi accurate strikes on the oil fields might damage infrastructure and could possibly cause considerable dollars in ecological and infrastructure damage. The rumors of procurement of the S-300PMU-1 (SA-20A GARGOYLE) by Azerbaijan would give them [anti-tactical ballistic missile] capability against the R-17, though those talks have only been rumors so far. This was apparently written before the recent military parade in Baku, in which Azerbaijan's S-300 acquisition was confirmed. Since that fills the largest apparent gap in Azerbaijan's air defense system, they seem well covered now. MiG-29 (FULCRUM) fighters delivered via the Ukraine. In this light, particularly given the lack of a high-intensity air war at any point during the conflict, the SAM systems deployed in and around Nagorno-Karabakh remain a deterrent to future aggression. Overall Armenia’s air defence seems to be robust given the nature of the threat it faces and the systems on hand. Compared to Syria, whose overlapping [surface-to-air missile] coverage relies on legacy S-75 and S-125 batteries, Armenia SAM capability is more sophisticated against [tactical ballistic missiles], cruise missiles and modern fighter aircraft. Compared to Iran, it does not have sizeable gaps to provide aircraft with [electronic countermeasures] packages to move freely. The small size of the nation provides an advantage to the deployed assets. In a true modern context with an unlimited strike package, Armenia’s air defence can be oversaturated. With over 500 modern aircraft in the Turkish air force inventory and the limited scope of the S-300PT against a salvo of modern cruise missiles it will have it shortfalls. Armenia will be forced to be content with the losses it would inflict on the enemy, as only a very strong modern ECM package might just disrupt some of it guidance of missiles. Armenia will still have opportunity to provide losses to the enemy with Russian S-300V1 and Armenian S-300P-series systems. Of course, a Turkish air attack on Armenia is pretty hard to imagine. The report does note that eastern Armenia is not well covered by SAM systems, and thus could be vulnerable to Azerbaijani air attack. That, though, would widen the war more than Azerbaijan may want. An attack on Armenia proper could trigger the Collective Security Treaty Organization's collective defense provision, and bring Russia and other CSTO members into the fight. Would Azerbaijan want to take that risk?